Looking for Valentine’s Day Gift for Her? There are so many different directions you can go when it comes to purchasing a Valentine’s Day gift for the special lady in your life. You can go the traditional chocolates and flowers route. You can take her to dinner and a movie. You can buy her lingerie. Oooh la la. Or, if she loves all things beauty related, you could put together one amazing basket full of products she will love and use on a daily basis. What kinds of products you ask? I’m here to help. From items to help her streamline her beauty regimen to a company that gives back, I have some fantastic beauty products to tell you about today. Lavender Shimmer Manicure Set — Bella’s manicure accessory kits contain all the essentials for maintaining beautiful, well groomed nails at home or on the go. 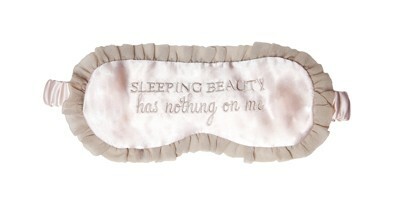 Luxuriously packaged in a petite silver snap case with darling patterns on every tool. Shown in purple shimmer exterior with Ikat pattern on tools. 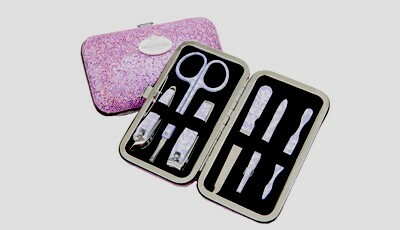 Includes (from left) cuticle pusher, tweezers, nail file, cuticle clippers, scissors and nail clippers. Boo Boo Couture Ice Bag — Bella’s Boo Boo Couture Ice Bag soothes anything that gives you an “ouch.” This stylish pack eases your pain and looks fabulous, even when you don’t feel so fab. Use for headaches, pain, bruises, boo boos, and whatever ails you. Simply fill with ice and cold water – or use warm water for soothing heat therapy. Screw on cap and place wherever you hurt. Shown here in Pucci Inspired Pattern. 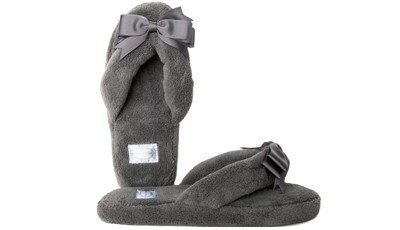 Gray Spa Slippers — Bella’s spa slippers will have you kicking off your heels and pampering your peds. With a cushioned foot bed, great style and a sturdy rubber sole, our slippers are perfect for wearing round the house or home from the spa. Comfy & cute, our latest designs feature an adorable grosgrain bow. Shea Body Balm — Their dense body balm enriched with 95% unrefined shea butter, lavender and honeysuckle essential oils, moisturizes and protects the skin from daily elements leaving your skin healthy, smooth, and beautiful with a hint of fragrance. Excellent for your dry skin, especially elbows, knees, feet and hands. Their 100% unrefined, natural shea body balm moisturizes and protects the skin from daily elements leaving your skin healthy, smooth, and beautiful! Excellent for your dry, irritated, and sensitive skin. 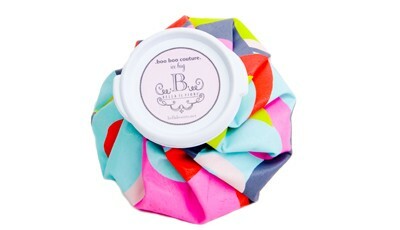 Shea Butter Lip Balm — Their smooth, delicious lip balm will moisturize and nourish your lips, leaving them silky soft. 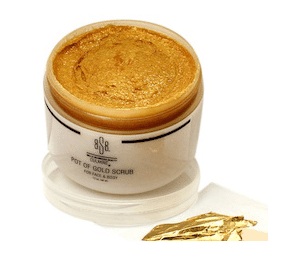 BSB Pot of Gold Face & Body Scrub — You struck gold with this luxurious and indulgent face and body scrub. Chock full of amber, pure sugarcane, caviar and hydrating jojoba oil, this real gold-infused treat turns skin satiny smooth and is heavenly scented. Amino acids and Vitamins A, D, and B provide anti-aging benefits to boot. Cleopatra used to spoil herself with gold body treatments. It’s about time you did, too. 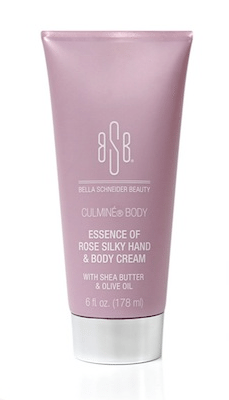 BSB Essence of Rose Silky Hand and Body Cream — Infuse hands and body with rich moisture and powerful anti-aging properties with our smooth and silky Rose Cream. Shea butter and olive oil soothe and quench thirsty skin; collagen, wheat protein and vitamins A and E soften, firm and protect against the elements. 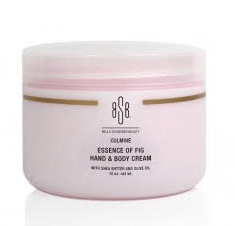 BSB Essence of Fig Hand & Body Cream with Shea Butter and Olive Oil — Bathe hands and body in rich moisture and powerful anti-oxidizing as well as anti-aging properties. Shea butter and olive oil smooth and quench thirsty skin while vitamin E nourishes and protects against environmental damage. Delicately scented with fig essence.